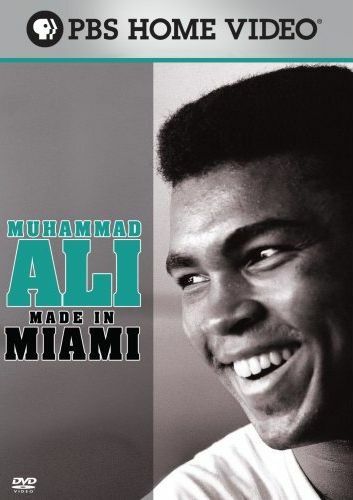 Muhammad Ali: Made in Miami is the latest in what I can only assume is a lot of documentaries about Muhammad Ali. Thankfully for me, I've never seen any of the others (except for that kinda boring major motion picture starring Will Smith), so I still had some interest in learning about this legendary boxer. For those who don't know, Muhammad Ali was actually born as Cassius Clay, and only changed his name later after he joined the Nation of Islam. This documentary mostly focuses on the fighter before he became Muhammad Ali, when he lived in Miami and trained at the Fifth Avenue Gym. Back in 1960, a talented boxer named Cassius Clay moved to the great city of Miami, Florida. There, he began training at the Fifth Avenue Gym with trainer Angelo Dundee, which helped raise his game. But training is only a part of the story. What helped Clay to become great was the way he presented himself to the people and the press, as an overconfident trash-talking badass, the likes of which we now constantly see in the pro-wrestling circuit. And in fact, that's where he got the idea from. It was "Gorgeous" George Wagner, a popular wrestler at the time, that could easily incite crowds into a frenzy with just a few choice words. Of course, bragging means little if you don't have the skills to back it up, and luckily Cassius had some mad skills. His fighting style was completely different from anyone else, going completely against convention. For instance, Clay neither keep his arms raised in guard position nor kept a solid fighting stance, instead electing to keep his arms low and lean back to avoid hits. Thankfully, Angelo Dundee was a good enough trainer to recognize that enhancing Clay's own unique style was the way to go rather than trying to get him to conform to standards. What really ended up making Clay a legend, however, is his 1964 fight against the heavyweight champion of the world, Sonny Liston, in Miami Beach. Clay was the extreme underdog, with practically nobody expecting him to win. Thankfully, we get to see a lot of this fight in the documentary, which was actually pretty cool. You can immediately see the differences in the two fighters styles, with Clay hopping around the ring easily avoiding Liston's punches, and often getting jabs past Liston's defenses. It wasn't completely smooth sailing, however, as in the fourth round, some of the chemical that was applied to a cut under Liston's eye somehow found it's way seeping into Clay's eye, so by the following round Clay was unable to even see. Talk about intense! Could you even imagine being in a ring with a heavyweight fighter who wants to punch your lights out and you can't even see?! Somehow Clay managed to survive the round, and his eyesight cleared up, enabling him to deliver even more blows in the next round. And that would be the final round, as Liston was unable to continue when the bell sounded to begin round seven. This was probably the best part of the documentary. Next, it moves on to how Clay met Malcom X, joined the Nation of Islam, and received his new name. At only sixty minutes long, they do manage to fill up the time pretty good. It was an interesting look at the famous fighter, and really did help me to understand why he is considered to be so great. The only extra feature on the disc is an interview with the producers, and I've gotta say that this was pretty dull. You could easily skip it and not miss anything. Anyway, if you don't know much about Cassius Clay or Muhammad Ali, then I'd say check this out. Not sure it's one you'd need to actually own, but I think it's worth seeing at least once.